This is a great throwback to some classic Brit rock tones. Those classic Brit rock tones. ‘Cool Britannia’ visuals. Power supply fitting could be more secure. Apart from Frank Zappa´s Muffin Man and Motley Crüe´s tender love song Slice Of Your Pie, rock music isn´t exactly brimming with references to home baking. The closest your average guitar hero gets to the ingredients in a cookbook is the baking soda used to bulk up his marching powder. So why has Electro-Harmonix named its new distortion pedal after a breakfast treat? It´s a reference to the legendary Big Muff, the classic overdrive pedal of the 1970s. But there´s a world of difference between the English Muff´n and its older sibling. While the Big Muff is a solid-state unit, the English Muff´n is driven by two 12AX7 valves - the same ones that gave Marshall amps their awesome tone back in the 1960s. That explains the ‘English´ bit on the nameplate, but this cool pedal is just the thing for introducing classic rock sounds into your existing setup. The pedal´s gain control allows you to dial in anything from a warm, bluesy breakup, to a balls-out metallic roar. And there´s enough variation in the filth to suit any kind of player. To tweak the tone, there are knobs for low, mid and high. This puts all sorts of juicy tones at your fingertips: think Pete Townshend, Jimmy Page and Eric Clapton. Clapton´s original 1960s tone, achieved with a Les Paul and Marshall setup, inspired a generation of rockers in their choice of gear. 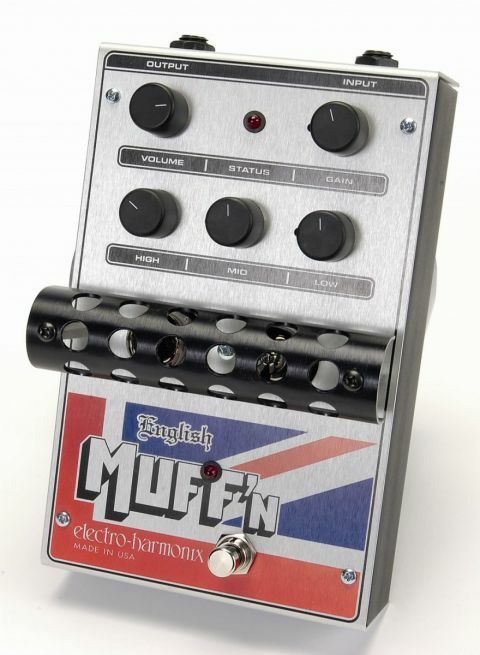 The English Muff´n captures that legendary sound. It´s delicious.